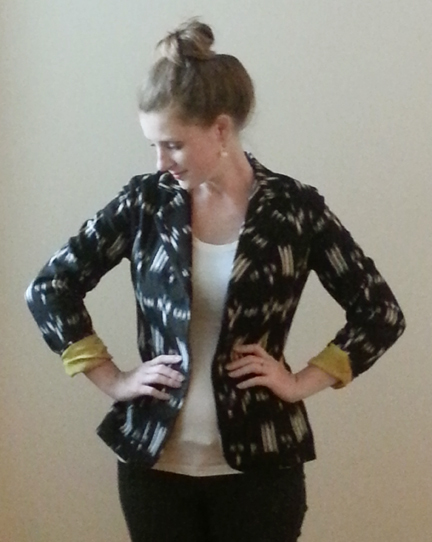 I entered my blazer into Patternreview’s lined jacket contest. There are some great blazers. Click here to vote for your favorite. I love that blazer!!! I hope you win! That is exquisite! Love the yellow and black. Definitely a winner. Is that Japanese cotton? I am not very sure what kind of cotton it is. It is pretty coarse to the touch so I am thinking that it might be a linen blend. I love love this jacket – gorgeous! I have been looking for a similar pattern, because I am so not drafting my own! I’m headed on over to vote for you! Just checking in on you! I love the blazer and your hair looks awesome! It seems like a different color? This just proves it has been way too long since I’ve seen you. Alissa, how are you?! Thanks for checking in. No, same hair color, just parting it in the middle more now. Hope to see you soon. Voted! I absolutely love this, and I really hope you win! You have my vote. I love this jacket! LOVE, LOVE, LOVE! Did you get that fabric at Chic in the Garment District? I think I saw it. Love what you did with it!